Enjoy an immersive experience at the Sydney Opera House and along the Great Barrier Reef, within the tropical rainforest of Daintree and the idyllic beaches of Gold Coast during your personalized Australia family vacation. Indulge in the perfect exploration of the Land Down Under with access to the majestic landscape and beautiful wildlife spread across the continent. Ride a camel in the Red Desert as the sands change color at sunrise. Experience the fascinating legends of Dreamtime. 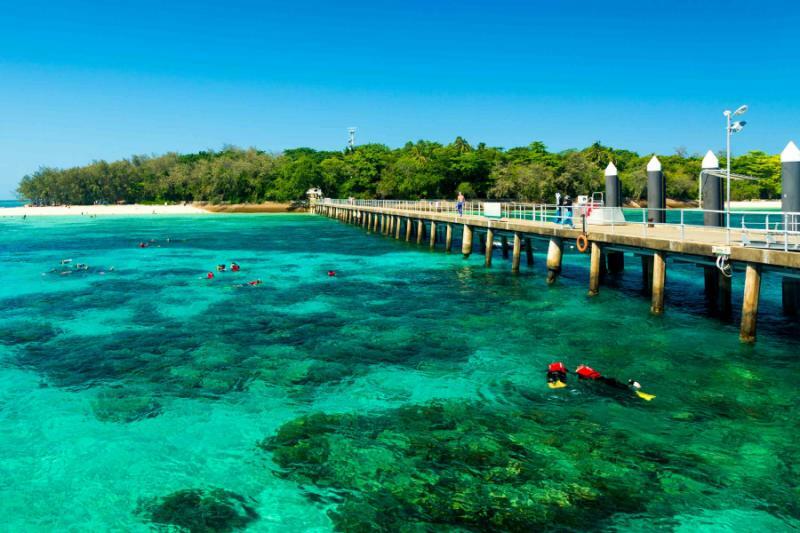 Search for tropical marine life and explore the untamed dense rainforest canopy while adventures enrich your time on your family-friendly Australia tour. 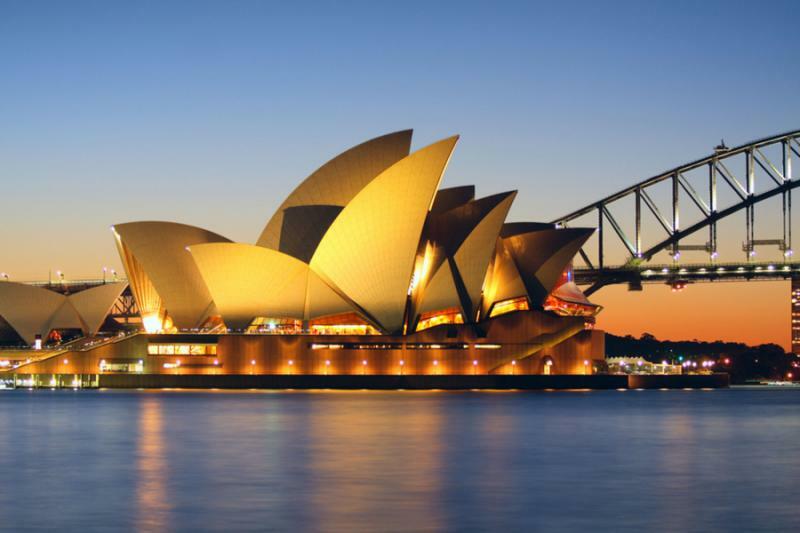 For further inspiration, consider browsing our other Australia tours on Zicasso. Experience the splendor of Australia on your 10-day a family vacation perfect for older children and teenagers interested in wildlife, culture, and exciting adventures across the continent. There is never a dull moment when immersed in the active lifestyle that takes you from Sydney to Uluru, Cairns to the Gold Coast. Whether craving stories of Dreamtime while sitting underneath the desert stars or scouring the coral gardens in search of clownfish, the thrills of Australia will bring the family closer together by sharing the wonderment. The family-friendly journey begins with your arrival in Sydney. The capital of New South Wales brings the iconic images of Australia to the forefront at the harbor featuring the Sydney Opera House and the Harbour Bridge. Your two days in the cosmopolitan city take you on a wonderful whirlwind of wildlife as a zookeeper for a day inside the Taronga Zoo. Learn about exotic animals with a privately guided tour and explore the waterways of Sydney Harbour on a friendly luxury cruise. Learn about the intricate details of the Opera House and enter into the main theater where you can appreciate the attention to detail. Travel to the Red Centre at Uluru to absorb the majestic ambiance of the desert landscape showcasing the splendor of Uluru and Kata-Tjuta. The geological features carry fascinating Aboriginal legend connected to the creation during Dreamtime. Delight in a gourmet dinner under the stars while locals share the stories of regional history and legend, ride a camel at sunrise to watch the landscape change colors, and wander the bulbous orange mounds of Kata-Tjuta. The city of Cairns sits on the edge of the Great Barrier Reef in view of the rainforest rising up the slopes of the Great Dividing Range. Three days in the tropical atmosphere introduces you to the culture at Tjapukai Aboriginal Park and lets you wander the artisan market and quiet streets of Kuranda situated in the forested mountains. Travel to a pontoon for a series of activities around the Great Barrier Reef and witness the unique attributes of crocodiles at a crocodile adventure park. Three days at Gold Coast shows a different side of Queensland where thrilling excursions lead the family onto jet-boat outings speeding alongside the coastline and kayaking tours around Wave Break Island. Snorkel along the fringe of the manmade islet for incredible views of tropical fish or relax on the soft beach. You will take a four-wheel-drive vehicle to the plateau crowning Mt. Tamborine that uncovers waterfalls and wildlife, pristine sub-tropical rainforest and a local farm known for hosting elaborate barbecue lunches. Looking for the top Australia tour ideas? 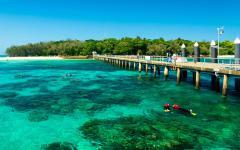 Consider browsing our Australia travel reviews page. Sydney is the oldest city in Australia dating back to the 18th century and former European penal colonies from which the greater contemporary country was established. Narrow cobbled lanes continue to wind around the historic neighborhood of the Rocks encompassing the remarkable history of sandstone warehouses along with the reutilization and celebration of the city’s past. The iconic sail-like roof of the Opera House decorates the promenade protruding from Darling Harbour as the steel figure of Harbour Bridge hovers above the entrance to the natural shelter. Your flight arrives at Sydney Airport, where your private transfer greets the family at customs. 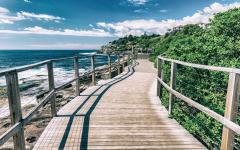 After relaxing in the comforts of your luxury hotel overlooking the sailboats passing through the harbor, the family will take the ferry to Taronga Zoo for a unique introduction to the city. The zookeeper greets your party at the entrance expressing his love for wildlife and his interest in all the 340 species of animals inside the exhibits. The kids are thrilled with the opportunity of acting as zookeepers for a day by going behind the scenes of some of the zoo’s most popular animals. They listen to the fantastic stories of caring for the animals like zebras. You enter the walking area connected to the giraffes. The kids help prepare the food for the enclosure and meet with the animals. They dip their long necks over the gate to greet you searching for their dinner. In the morning, you enjoy looking out the window over the harbor and finding the sailboats gliding across the water past the crisscrossing ferries. After breakfast, the family boards a luxury yacht for a cruise around the famous sites of Sydney Harbour. The cool breeze blows over the hull of the boat carrying the briny scent of the salt water. The Opera House quickly passes by as you cruise closer to Fort Denison. 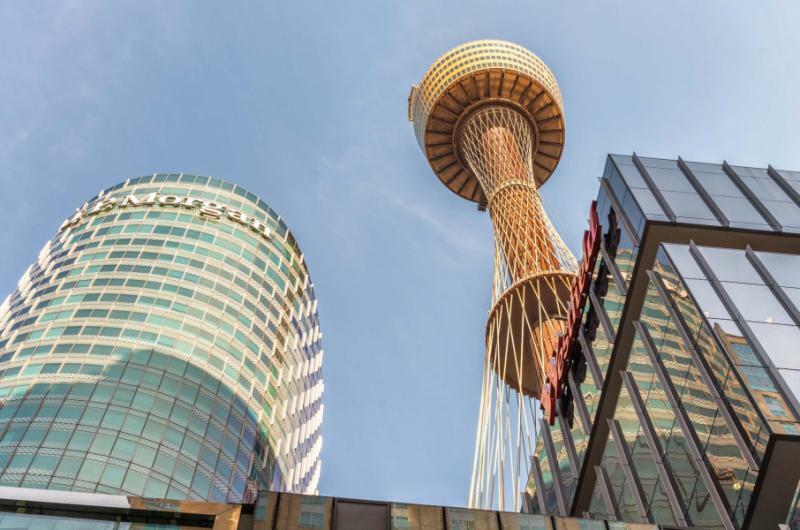 The small defensive facility rises out of a small island offering a 360-degre view of Sydney’s Central Business District and the surrounding suburbs. The museum hosts the canon guns and a popular winding staircase leading to the top of the only Martello Tower in the country. You can see the Sydney Harbour Circle Walk wrapping around the edges of the shoreline with stunning views to the Royal Botanic Gardens. 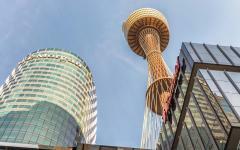 The skyline soars above the encircling city topped with the Sydney Tower. 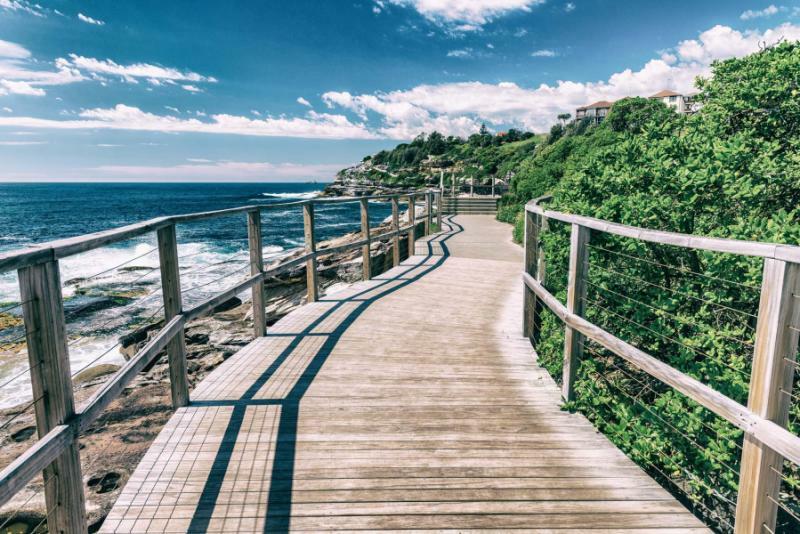 After returning to shore, your guide leads you to the promenade hosting the famous Sydney Opera House. The water encircles the walkway on three sides lapping at the edges of the brick walkway. Over 67,000 square feet of glass allow natural light to fill the interior halls while providing a shell-like design. 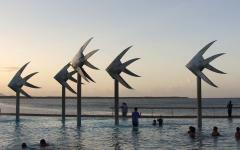 The structure opened in 1973 and has since become one of the most distinguishing figures of Australia. 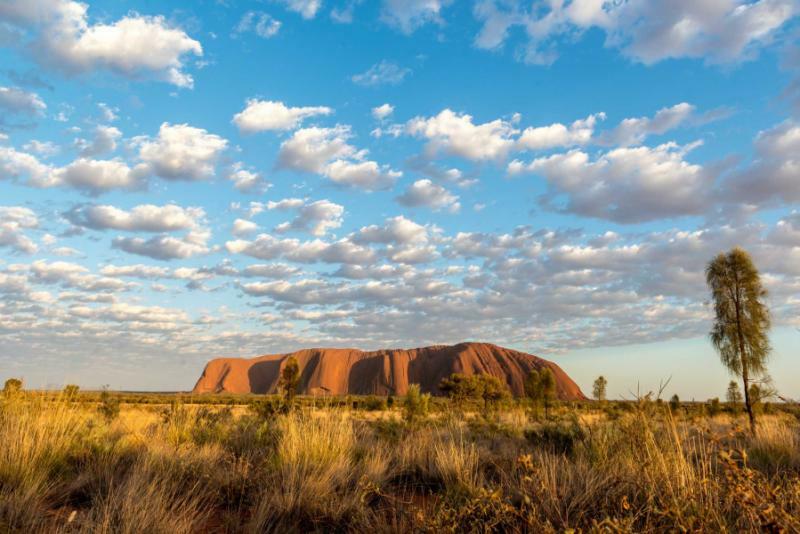 After an early breakfast, your private transfer escorts the family to Sydney Airport for your flight to Uluru in Australia’s famous Red Centre. The majestic scenery captivates the entire family with promises of stargazing in the vast desert sky and spotting wildlife rushing across the expansive rocky and sandy landscape. 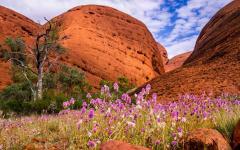 You travel from the airport into Uluru-Kata Tjuta National Park spanning 515 square miles. 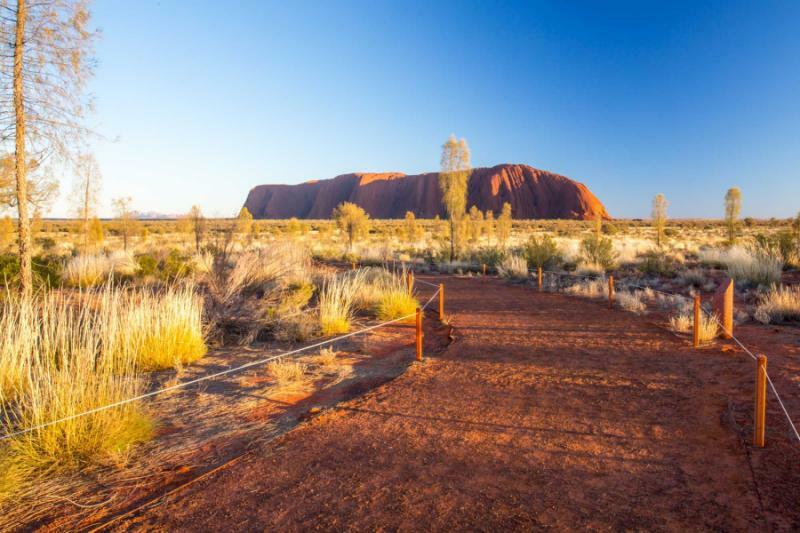 The cultural center offers insight into the marvels of the Uluru and its scared connection to the Anangu nation. The enchanting images of locally crafted artwork reflect the symbols of the region with wooden tools and artifacts, as well as jewelry, pottery, and paintings. The stunning symbols have different meanings connected to the stories of Dreamtime. The kids listen intently to the significance of the details, with concentric circles representing the waterhole, wavy lines reflecting running water, and arrows pointing downward showcasing spears. 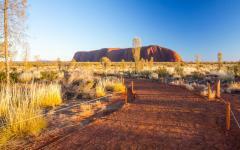 You exit the center and take to the walking path surrounding Uluru. The 600-year-old sandstone rock formation has a remarkable ambiance with an ancient spiritual connection to the Anangu nation. Lizards, bush turkey, emu, and red kangaroos roam the landscape around the scattered bushland. The stories of Uluru emerged from the legends of Dreamtime when two boys played in the mud after the rains, as well as the formation of the world by the Rainbow Serpent. You wake up before breakfast for a view of Uluru at sunrise. The family joins you wiping the sleep away from their eyes to see the shifting colors of the sandstone rock. You ride camels across the desert sands learning Australia has a large population of wild camels roaming the Red Centre wilderness. Their bodies sway in as they walk giving new meaning to their nickname, “ships of the desert.” The milky gray hue of the silhouette transitions to a warm faded purple a bright red, and finally a golden orange with the sunlight expanding over the horizon. 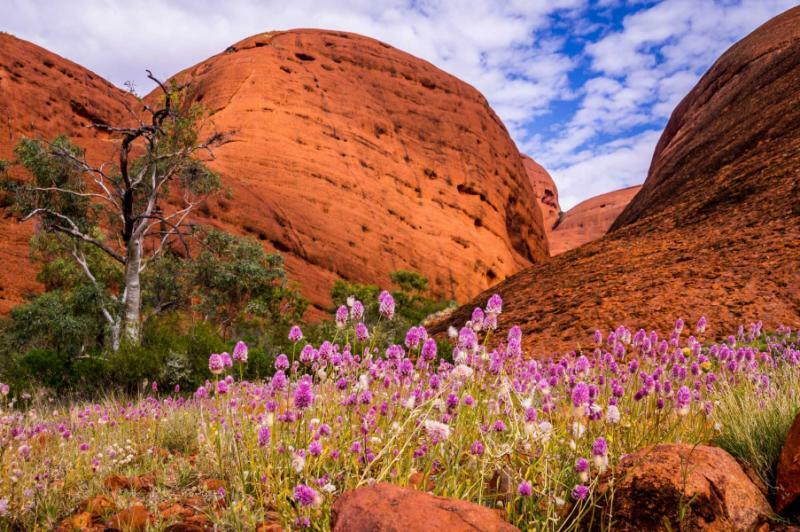 Your guide leads the family into wilds of the untamed desert landscape at Kata Tjuta, the ancient rock formations approximately 18 miles away from Uluru. The giant sandstone boulders protrude from the surrounding flat, arid scenery at 3,497 feet above sea level. The wind and rains shaped the rocks over 500 million years. The local Pitjantjatjara word “Kata Tjuta” means “many heads,” referencing the story of the boulders’ creation and their resemblance to heads rising out of the ground. The majority of legends for the area are kept secret due to the sacredness of the site. 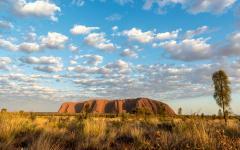 You return to the airfield at Uluru for your flight to Cairns, located on the northeast coast of the Coral Sea. 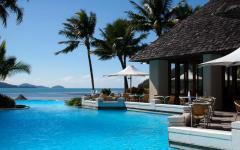 You welcome the transition between the dry heat of the Northern Territory’s desert landscape and the wet warmth of the tropical shores of Queensland. At breakfast, you catch the savory aroma of grilling bacon emanating from the kitchen. The sweet scents of pineapple and banana fill the dining room with the fruits sourced from the tropical plantations across Queensland. The family makes their way to the marina in the morning and boards the boat bound for the marvels of the Great Barrier Reef. The cool breeze carries the refreshing briny fragrance from the Coral Sea. 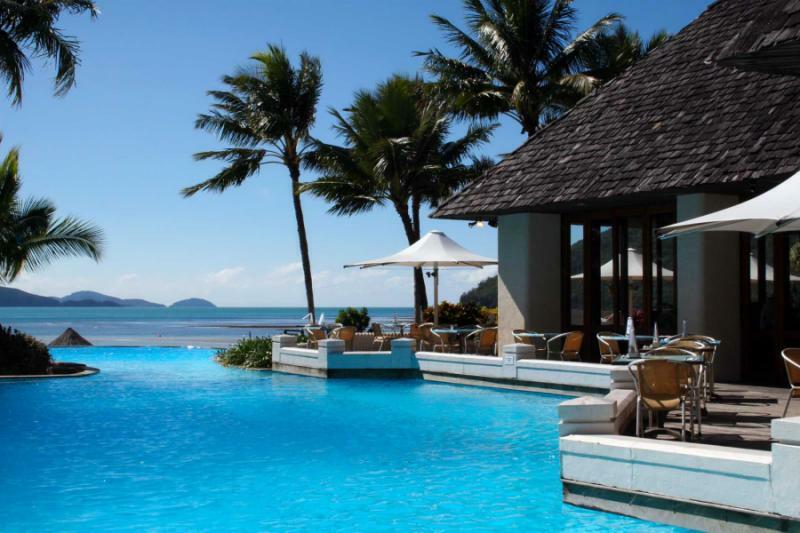 The translucent turquoise water highlights the pristine ambiance of the tropics. 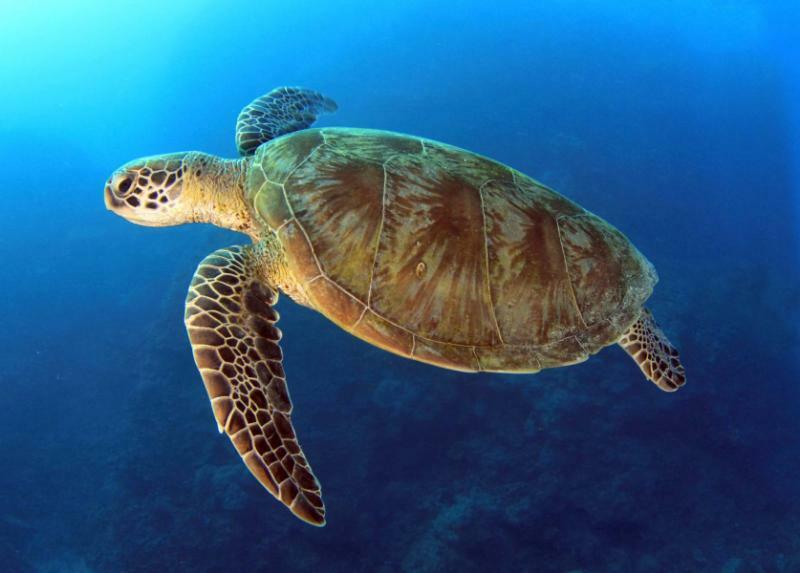 The Great Barrier Reef is known for containing more than 3,000 individual reef systems with 600 types of coral. Dolphin pods cruise through the gorgeous waters leaping from the sea and sea turtles graze on the seagrass growing from the ocean floor. The pontoon on the Outer Reef provides the family with the perfect point of exploration for those happy to swim in the open waters above the ribbons of reef or those preferring different modes of viewing of the tropical world under the sea. You start at the underwater viewing platform with a helmet dive. The warm and refreshing water envelopes your body but the helmet keeps makes you feel like a deep-sea diver. You can walk along the floor near the edges of the rising limestone hills capped staghorn and brain coral. You spot a blue tang nibbling on algae and seaweed. They can grow up to 12 inches long with their yellow tail juxtaposing their blue and black colors. After breakfast, your guide leads the family to the edges of the rainforest at Tjapukai Aboriginal Culture Park for an immersive experience into the traditions of the Djabugay nation. The park opened in 1987 as a way to share traditional songs and dances but has grown to include an entire way of life spanning more than 40,000 years of Aboriginal culture in the region. The park encompasses 25 acres combining theater, the natural landscape, and modern technology to share the Djabugay nation’s stories. The interactive experience takes you into the cultural village where your guide gathers the local plants for cooking. The warriors lead expeditions into the forest hunting for food and providing explanations on tribal law. They shape their traditional spears and provide demonstrations on throwing the boomerang. The pulse and hum of the didgeridoo enchant the kids. The sound resembles a mixture of rumbling thunder and a blender. The kids take turns mastering the sound by blowing gently into the mouthpiece with puffs of air while flapping their lips. You continue to the Skyrail at Smithfield Terminal to board the gondola ascending to the rainforest town of Kuranda. You travel over the rainforest canopy with views stretching over the lush trees to the turquoise waters of the Coral Sea. Sporadic palm trees rise out of the ferns before you reach the center of the charming town hidden in the forest. 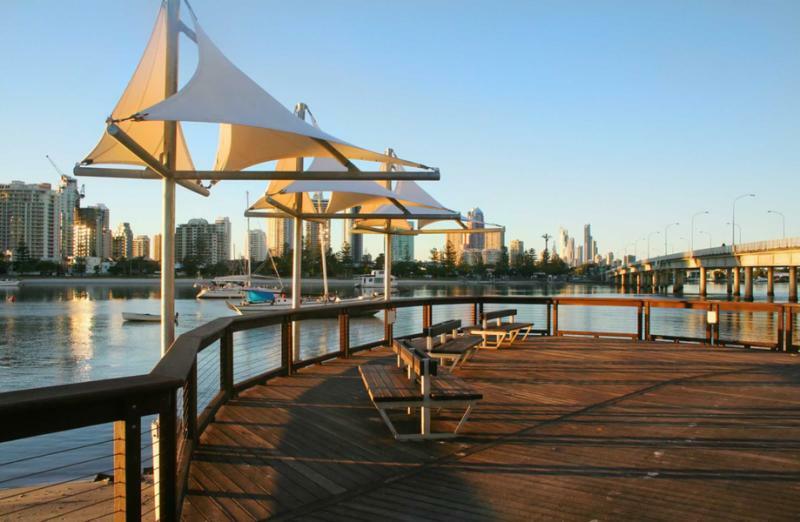 The quiet Coral Sea laps at the edges of the Cairns Esplanade Boardwalk in the morning. Locals jog along the half-mile the walkway lined by cafes and restaurants overlooking the water. Dramatic fish sculptures reflect in the saltwater swimming pond near the marina. After breakfast, your private transfer escorts the family to the airport for your brief flight to Brisbane. 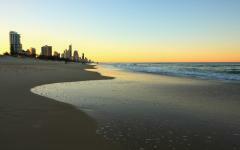 You quickly reach Gold Coast, a city dedicated to soft sands, bright sunlight, and easy surf. High-rises shape the skyline along the shores with over 32 miles of pristine beaches and celebrated wave breaks. You climb aboard the jet boat at Main Beach and set out on an adventurous thrill-ride zipping around 22 miles of scenic waterways. The air rushes through your hair as the boat spins for a 360-degree view stretching from the skyline to the open horizon. The boat reaches up to 50 miles per hour splashing water across the hull. You glide past the protruding roots of the mangrove forest on Crab Island and along the waterfront decorated with the glossy buildings of the Southport Yacht Club and Palazzo Versace Hotel. At breakfast, you can look out over the white sands of the beach and watch for surfers catching the morning break. 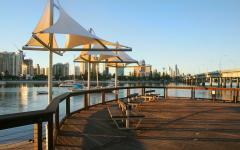 Locals of Surfers Paradise run along the seaside esplanade and exercise on the public equipment in view of the water. The prominent glass of the skyscrapers in the neighborhood glint against the sunlight towering over the nearly two-mile strand of beach. You travel to the shores of Wave Break Island. The manmade island was established in 1985 to protect the western foreshore from waves. Locals and visitors from around the world enjoy exploring the shoreline and waters home to one of the largest populations of fish in a single area. 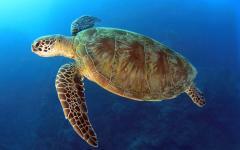 More than 50 different species swim around the shoreline reaching nearly 50 feet deep. Schools of the fish number in the hundreds providing a great opportunity for underwater photographs. Your teens kayak on the picturesque turquoise waters in looking for turtles and stingrays swimming below. Your guide mentions the probability of seeing dolphins swimming nearby. Everyone paddles with the current for an easy venture to the beach before you put on snorkeling gear and plunge into the warm, refreshing water in search of tropical fish. Your guide points to a passing stingray on the ocean floor. Stingrays are very passive unless threatened, leaving the family alone as it searches for food. Your guide greets you in the hotel lobby after breakfast eager to whisk the family away into the rainforest at Mt. Tamborine approximately 28 miles inland from Gold Coast. Walking trails wind beneath the dense canopy providing access to fantastic waterfalls. The ride into the hinterland is bumpy taking you off the main roads into the lush landscape. The preserved ancient Gondwana rainforest represents the prehistoric flora when Oceana was a single landmass. The giant ferns and budding flowers act as living fossils. Cedar Creek Falls reaches upwards of 65 feet tall with water tumbling over the rocky bluff. The circuited trail winds through the woods for approximately two miles. The water splashes against the rocks as it curtains into the waiting pool below. You continue to a local farm for a barbecue lunch on a vast homestead. The scent of grilling meat and vegetables fills the air. The staff on the farm happily demonstrate how they have used boomerangs and whips over time in the area. The trickling from the mountain stream offers a soothing soundtrack to the early afternoon as wallabies and kangaroos graze on the open field. The sunlight washes over the largest subtropical rainforest in Australia in the morning at Lamington National Park. The dense canopy cloaks the valleys and fades along the cliffs of the McPherson Range. Noisy pittas call out most actively in the morning with three ascending notes in repetition. They search the forest floor for insects, snails, and fruits. The waves break against Gold Coast’s shoreline bringing surfers back to the water. The eastern seaboard offers sensational access to nature’s bounty inland with remarkable rainforest and on the edge of the continent with fascinating coral reefs. After breakfast, your private transfer greets the family in the hotel lobby and escorts you to Brisbane International Airport for your flight home. "Very professional and diligent- pick great hotel rooms and suites- always on time"
"This tour company went above and beyond to make sure we had a great experience in Egypt." "Our travel company saw to all our needs and answered our questions in a timely manner."